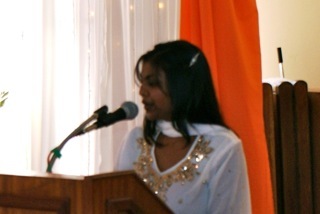 On the 31st January 2010, the Chatsworth Sub-Centre of the Ramakrishna Centre of South Africa hosted the Vivekananda Youth Forum. Swami Vivekananda has been extolled by many as a rishi, a social reformer, an educationalist and a saviour. Of special significance is the influence he had on the youth of both India and the rest of the world. This Youth Forum is based on the values that Swamiji advocated for the youth. The Forum, on that memorable day, consisted of four participants who represented four different organizations. Each participant was required to read an extract from the teachings of Swami Vivekananda and then share their own thoughts based on the extract. 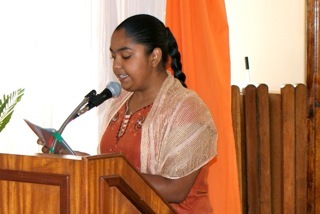 The first participant was sister Kalayvani Govender of the Vivekananda Mission who chose the topic “Education”. After reading out the valuable quote of Swamiji on ‘Education’, Kalayvani proceeded to explain the tenets of civilization. She emphasized the need to adopt Swamiji’s ideas as without which the civilization may reach disastrous results. She brought out topical reference of Haiti calamity and how the organisations doing relief work were vying with each other in popularity game instead of rendering service to the suffering in all humility. 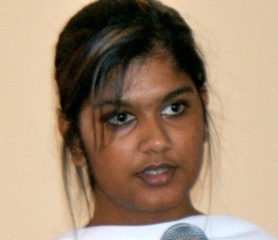 The next one was sister Alvna Santilall of the Sri Vishnu Temple Society. She spoke on “The Ends and the Means”. While explaining how ‘ends’ must be tallying with the ‘means’, she deplored that often the means were given more importance and anything could justify the ends. She gave out four methods to fortify the concept of ends having proper means: 1- Avoid evil company, 2- Attach to right conduct, 3- Practice Will Control and 4- Cultivate virtues. She concluded that life is a school calling sacrifice with reliance on God. The last participant sister Merisha Roopnarain of the Ramakrishna Centre of South Africa – Chatsworth Sub-Centre spoke on “Strength”. She analysed the character of strength as opposed to ‘weakness’. She aptly quoted Swamiji about the cause of weakness being not sticking to Truth. In order to increase ‘strength’ she advocated four methods: 1- Making good habits a regular feature, 2- Spending Time in constructive ways instead of gossiping etc., 3-Not fearing obstacles but look at them as challenges and 4- Never brooding over weakness. Sister N. Singh from the Sri Maha Ganapathi Mandhir was the next panelist, scheduled to speak on “Character” but, unfortunately due to untimely death in her family, she was unable to attend the Forum. 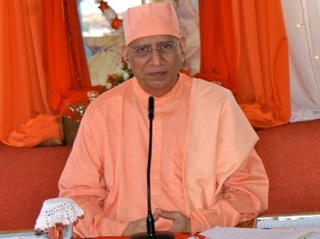 Once all the participants delivered their presentations, it was the turn of Revered Swami Vimokshanandaji Maharaj. He shared his thoughts and feelings on the three presentations and engaged in a period of questions and answers with the audience. As usual the Q & A session was not taking off due to the apparent shyness of the participating youngsters. He made the youth understand that their inability to raise questions was not actually due to shyness but due to weakness. He further told them that how Swamiji had thundered to the youth to ‘Be Bold!’ and lo! once one question was fielded, the youth started pouring in with questions. There was of course, interesting discussions on several themes especially that are concerned with their career and shaping their future life. Before beginning the Q & A session proper, Vimokshanandaji requested Mandusha Maharaj of the audience to come to the front and speak on the 4th topic ‘Character’. 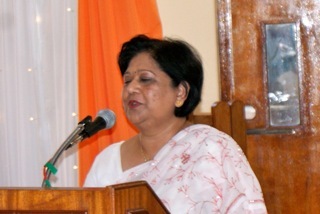 Madam Mandusha eloquently explained the salient feature of what was thought of as Character. She clearly spelt out the two means viz., keeping to Truth and surrender to God as the most important elements in developing Character. Thereafter Swami Vimokshanandaji made presentation of gifts to the panelists. The audience appreciated with loud applause madam Mandusha‘s kind gesture of sending the gift packet to the absentee panelist also who was in mourning. 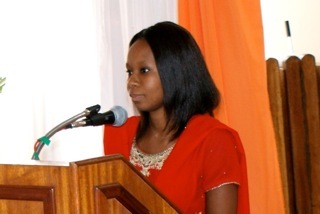 I feel blessed to have been given an opportunity to be the Director of Ceremonies on the Youth Forum occasion. It was no doubt challenging especially during question-answer session. But there is no end to learning. 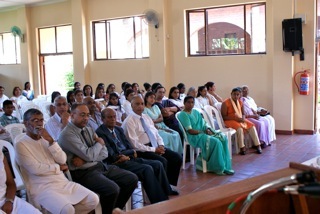 After uncle KK Pillay concluded the Forum with Vedic prayers, everyone partook of a scrumptious lunch and then departed. The Forum was a memorable one and the youth left the Forum having learnt valuable lessons of Life. Previous Post: Youth ‘Retreat’ – going ahead? I pray by the grace of the Holy Trio you are well. I am pleased to read a continuation of Swamiji’s birth anniversary in this release of your blog. No doubt reading and discussing Swamiji can only be to our benefit. “Man making education is what we want” said most revered Swamiji. Secular education has not contributed to our holistic development and has done nothing to eradicate the weakness that has been perpetuated over the generations. Swamiji says that we are all lions, once we discover this truth about ourselves through his profound teachings all our fear will be removed. Then strength only will manifest. All glories to Swamiji, king among men. May he continuously guide and inspire us.